There’s been a great deal of discussion among the chattering class regarding Bernie Sanders being a one note candidate. I’ll admit it’s bothered me as well. As much as he goes on about economic inequity, he’s short on details and long on idealism. And on other issues such as security, he has no plan at all. Additionally, he’s been such a maverick most of his career I wonder what kind of team he could put together, from cabinet appointments on down, that would do a credible job of running the country. That said, I recently heard Sanders explain why he feels that one note, economic inequity, affects every other issue we face today. The more I examine our culture, that belittles labor; and our systems, that accumulates wealth at the top to levels harkening back to the monopolistic roaring twenties, I feel Sanders is correct; this concentration of power and wealth is undemocratic. In short, I’ll be voting for him. But what do we do about the wealth gap? Where to start? Let’s start with this last point: concentrated wealth becomes investment. This is demonstrably false. We have suffered through the prolonged unconvincing recovery due to the very opposite; wealthy individuals keeping their wealth in cash or property, and not risking it in new enterprises and corporations doing the same; holding onto profit in the form of buying back stocks, keeping assets liquid and not re-investing or spending in product development. (Edit: not to mention the latest stories of untold wealth being held in tax havens such as the Bahamas or Venezuela.) The wealth of corporations and the uber rich is not being put to work. It is being amassed and withheld. But, let’s focus instead on the concept of redistribution. I don’t particularly like taxation as a leveling mechanism to address inequity. What we need to focus on instead is correct distribution of profit and success. We need to value labor correctly. This isn’t so much about questioning whether a knowledge worker in San Francisco deserves or needs a 150k salary. But it definitely suggests that we should question why the people who work the hardest or most unpleasant jobs, from agriculture to clerical, are somehow unworthy of a living wage. We should examine corporate profits and boardroom/executive pay in relation to how many employees are on food stamps or welfare. There is no reason why a company that produced four billionaire heirs (4 of the top 12 richest people in the world with an estimated 40 billion each) should have a single employee that requires public assistance. We need to properly define this as corporate welfare, not individual welfare. Whenever this subject comes up, I usually link to this article: The pitchforks are coming. This column began as a post on The New Moderate. This entry was posted on November 16, 2015 by A.J. 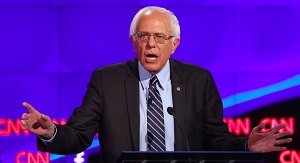 Simonsen in Advice and tagged Bernie Sanders, gap, income, inequity, redistribution, wealth.